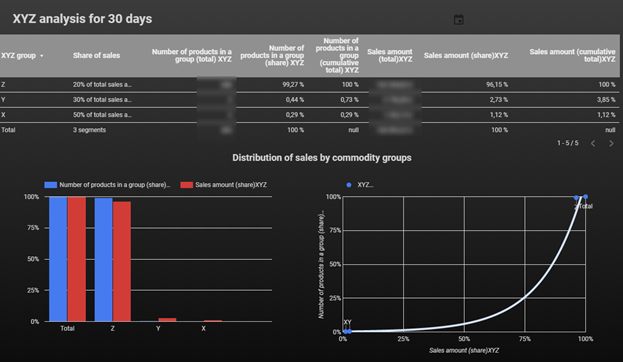 To better understand how product grid analysis will benefit your business, we examine a case study using anonymized data from a real project. 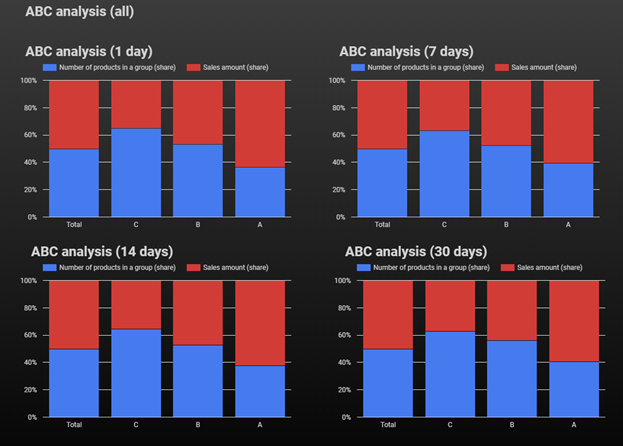 We look at ABC and XYZ analyses in greater depth, then show you how to use your own data in the process, and finally explain what results you can expect to achieve. Before we get to it, let’s recap the key benefits of product grid analysis performed in our BI. What’s your goal here in the first place? Define your non-liquids, make adjustments to keep top inventory replenished and dead stock discarded, and seamlessly detect and fix errors in the sales plan to boost purchase activity. 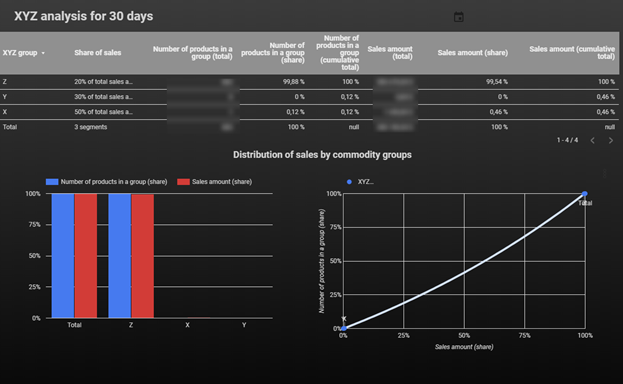 The BI helps you save time on reporting (reports are generated automatically) and visualize the whole picture in a snap. 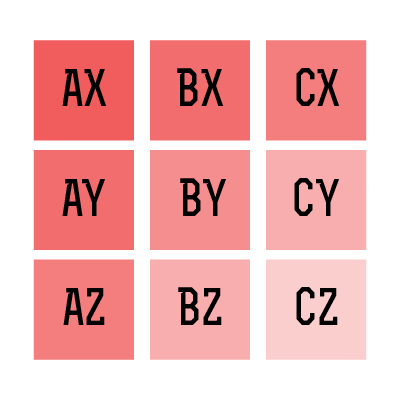 ABC and XYZ are the shortcuts to all-round product grid analysis. The matrix highlights your sales strengths/deficiencies and growth points. How does the system do that for you? For the purpose of ABC and XYZ analysis, all transactions from your CRM or e-commerce are exported and grouped by sales volumes over a specific period and transaction frequency. In the resulting graph, the ABC axis will reveal distribution of customers by revenue whereas the XYZ axis will display distribution by transaction frequency and demand predictability. This way, you’ll see right away what you can tweak to increase sales! Then again, no need to waste time extracting data and generating reports manually. Once the ABC research is completed, group A will include the best-selling products – 20 percent, group B will encompass the 60 percent with medium sales, whereas group С will be left with the remnant low-selling 20 percent. The same thing happens with XYZ: most popular products are placed into group X, irregular sellers into Y, and occasional purchases into Z. After the analysis, we can look at the intersection of ABC and XYZ, and determine the most popular goods and product groups. The products in groups А and В provide the largest sales volume. There should be more of those in the company. АХ and ВХ provide a considerable sales volume with regular repeat purchases. AY and BY provide good revenues but the demand is unstable. Think of bonus programs for these products or product groups. As for the goods in group C, you should thoroughly review those and discard some of them as inefficient. With СХ and CY products, see how you can increase the average order value. CZ accumulates the least relevant products or product groups. Don’t waste time, cash or stock space on those. These goods will most likely drag your company into bankruptcy. In the end of 2017, we performed analysis of a customer’s product grid and suggested changes in the matrix and the structure of goods purchased for the warehouse. Before we got down to work, the product grid looked like this (see the picture below). There were very few products in group А. Goods in groups B and C predominated, causing lower sales volumes. The product grid encompassed products with low or irregular demand – belonging with group Z. Based on the audit results, the customer modified their purchase policies and goods display tactics. The positive results weren’t long in coming! The number of goods in group А grew bigger. We’ve seen increase in the number of key products generating big demand. Now, we can see a bunch of products with predictable and stable demand! Long story short, due to the product grid changes the customer experienced a considerable sales growth by 135% in cash and 117% in transactions. In the picture below, you can see the dynamics and post-audit showings. 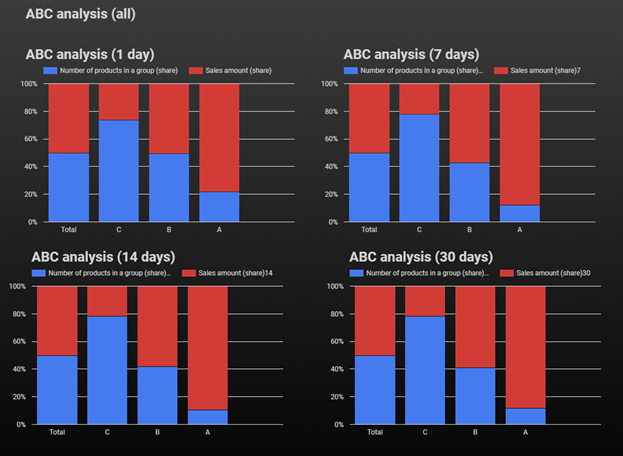 Interested to replicate these results on your data? Let us know! Meanwhile, stay tuned for more postings!